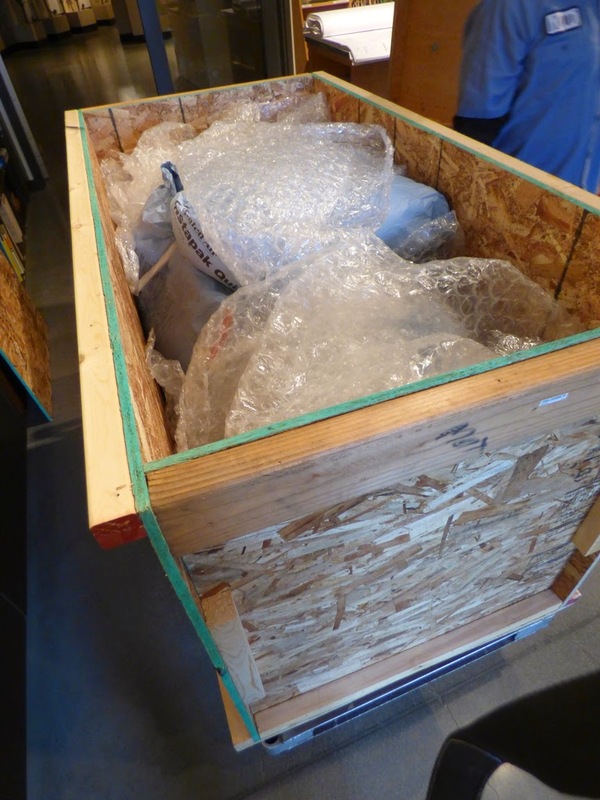 So, I got a call the other day from Receiving..."You've got a giant crate that's been delivered. Where do you want it? And I think "Huh? I don't remember having anything on order". And then in the fog of my brain (it's finals week; I'm more addled than normal), a vague memory emerges: we ordered something a year ago! And it finally arrived! The crate was indeed huge. We had to remove close to two dozen screws, and like the father in the movie "A Christmas Story" ("fra-gee-lay"), we found a great deal of stuffing. But slowly it emerged: Jaws. Very big jaws. The children of the Great Valley are impoverished and are poorly served by a state that sometimes has other priorities than education (can you spell "prisons" or "tax breaks for the rich"?). Few of the students have spent much time beyond the boundaries of their own towns, and have little knowledge of the natural world that lies beyond the housing developments and farms. The Great Valley Museum at Modesto Junior College has labored for years to teach our children about the rich ecosystem that once existed here (and still exists in small pockets here and there), but the exhibits languished in a modified 80 year old converted house. At long last this is changing, and we are on the verge of opening up the new museum on the bottom floor of our Science Community Center in just a month or two. The museum will be an essential destination for learning about the natural history of the Great Valley and surrounding regions. 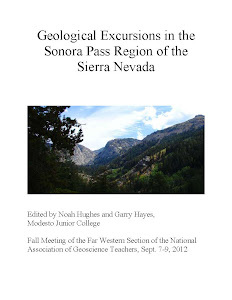 Now, I'm all for this kind of thing (just take a short look at my other blog, for instance), but the unfortunately sad other fact is that practically no one in our county is familiar with the incredible paleontology of our region. Mention "digging for fossils" and most people think dinosaurs, and invariably dinosaurs in some other place. 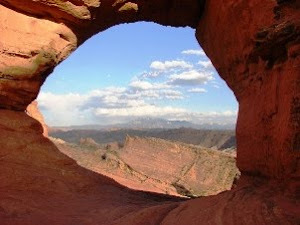 But the history of our planet is much more than just dinosaurs, and our region is richly blessed with an incredible fossil record of strange and wonderful creatures that have lived here through the ages. I've discussed them in the past, and will do so again, but today's arrival was a special part of our fossil heritage. In the waning part of the dinosaur era (the Mesozoic), a creature related to the Komodo Dragon adapted to living in a marine environment, becoming one of the top predators of their time. 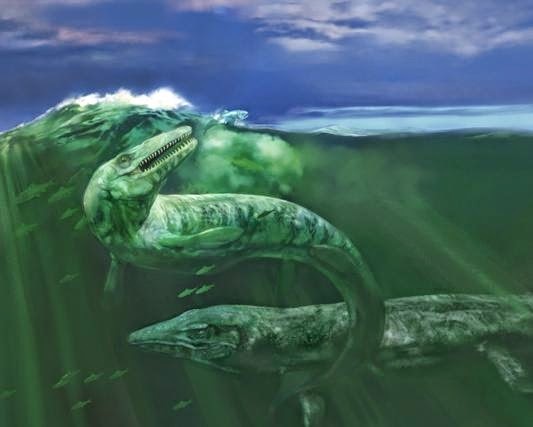 Upwards of 30-40 feet long, the Mosasaurs were terrifying, with massive teeth, huge jaws, and presumably a huge appetite for anything that swam the seas. They have been found worldwide, and several have been found in the sediments of the Great Valley Group. 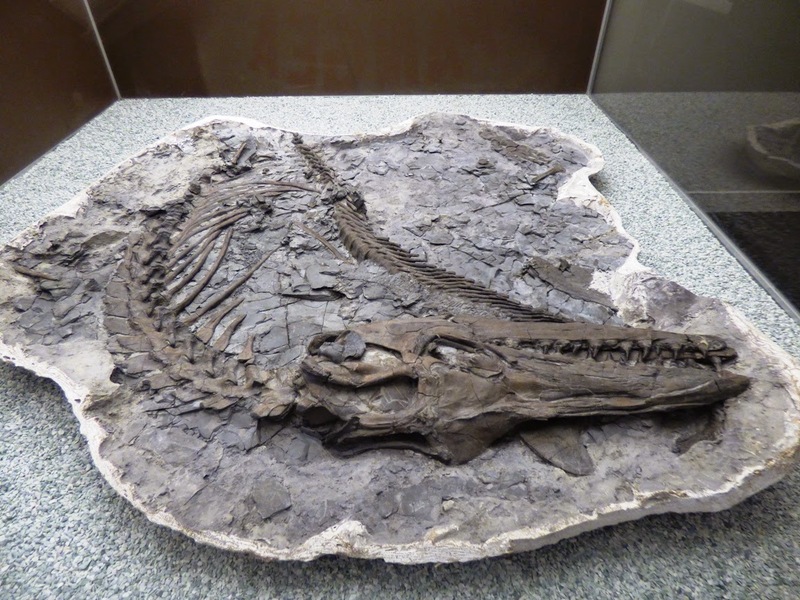 An excellent specimen of a creature called Plotosaurus bennisoni was discovered in our county by a young man from Gustine in the 1930s. They were here! 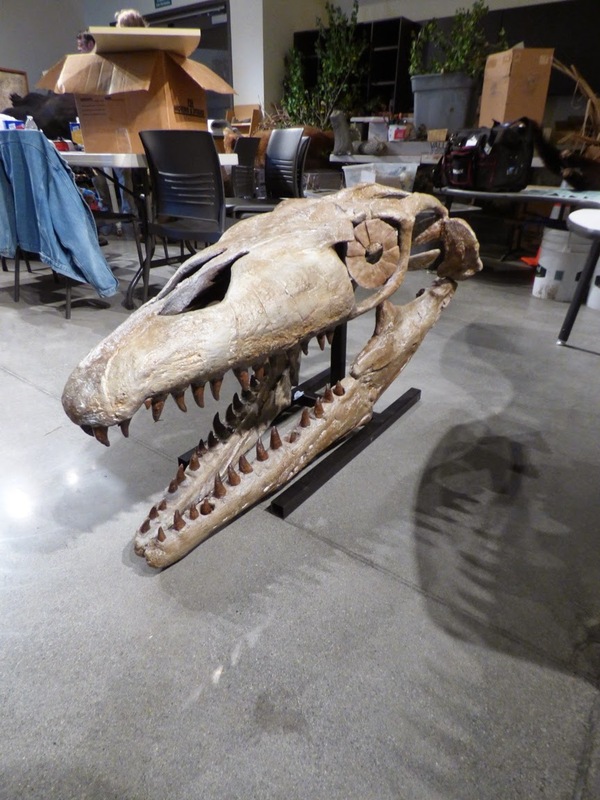 Another specimen, called Prognathodon rapax was discovered in Fresno County to the south of us. No one sells specimens or replicas of those exact species, so we purchased a related species that will get the point across. 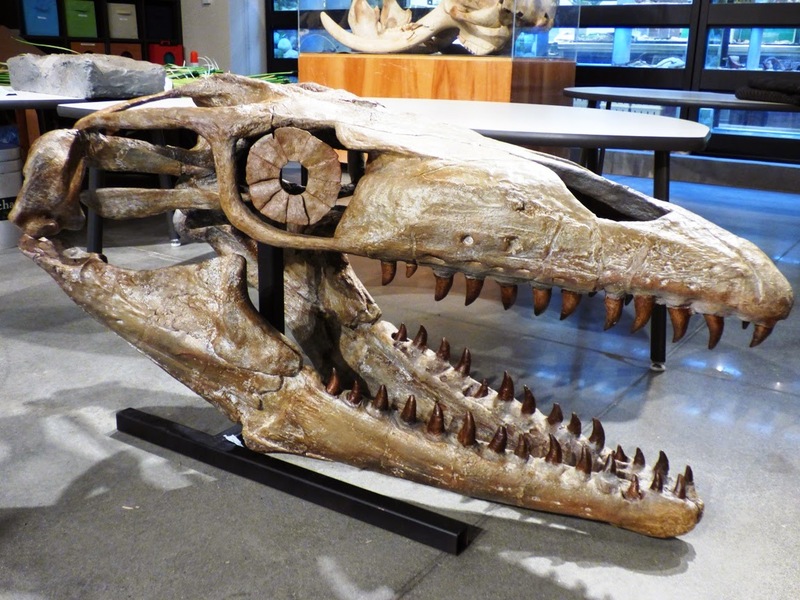 It's a skull of a Prognathodon stadtmani that was discovered in the Durango, Colorado region. It is a big skull! I can't imagine a child upon seeing this skull not wanting to get out and explore and maybe find one on their own. And knowing that it could actually happen because one like it was found in their own county. The dinosaurs were okay, they might think, but we had really interesting creatures that lived right here! This is an exciting time for the children of our valley, even if they don't know it yet. They are about to discover a world, their world, that includes massive and sometimes ferocious creatures like the Mosasaurs, Ichthyosaurs, Plesiosaurs, Saber-tooth Cats, Short-faced Bears, Dire Wolves, American Lions, Megalodon sharks and many others.